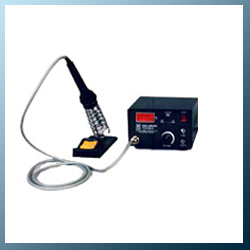 Digital Temperature Controlled Soldering Stations , Pune, Maharashtra. We bring precisely engineered and high quality soldering stations Wich offers temperature controlled hand soldering. It offers option of rapid heat up, instant heat recovery and superior heat transmission. they have simple and compact structure and have all the features required for professional electronic soldering. Our digital soldering stations are offered with special 17V/35W & 24V/50W leakage proof iron and there tip is grounded for MOS & CMOS IC’s, transistors etc. It has LED indication switch for ON/OFF. It has the RAM controlled cricut to give you the best result . The Three digit LED display to read /set temperature for control station. They have a powder coated stand for iron holding & tip cleaning sponge is provided with each unit. Temperature can be from 200°- 450° C by set pot. There is an element fixed with 3 self threaded screws in handle. It has proper grip and locking due to polarizing four pin metal connector. Our machine has ergonomically designed ABS handle , powder coated cast iron stand with plated spring along with bakellite bush. Mains ON-OFF with LED indication switch. Polarizing four pin metal connector with proper grip and locking. One of the six different types of long lasting bits.